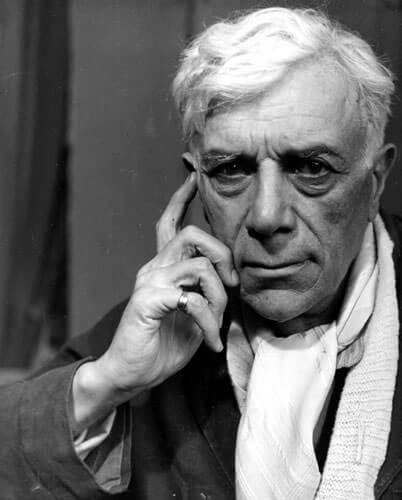 Georges Braque was born in Argenteuil, Val-d'Oise. He grew up in Le Havre and trained to be a house painter and decorator like his father and grandfather. However, he also studied serious painting in the evenings at the École des Beaux-Arts, in Le Havre, from about 1897 to 1899. In Paris, he apprenticed with a decorator and was awarded his certificate in 1902. The following year, he attended the Académie Humbert, also in Paris, and painted there until 1904. It was here that he met Marie Laurencin and Francis Picabia. Braque's paintings of 19081913 began to reflect his new interest in geometry and simultaneous perspective. He conducted an intense study of the effects of light and perspective and the technical means that painters use to represent these effects, appearing to question the most standard of artistic conventions. 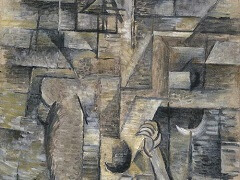 In his village scenes, for example, Braque frequently reduced an architectural structure to a geometric form approximating a cube, yet rendered its shading so that it looked both flat and three-dimensional by fragmenting the image. He showed this in the oil painting "House at L'estaque". 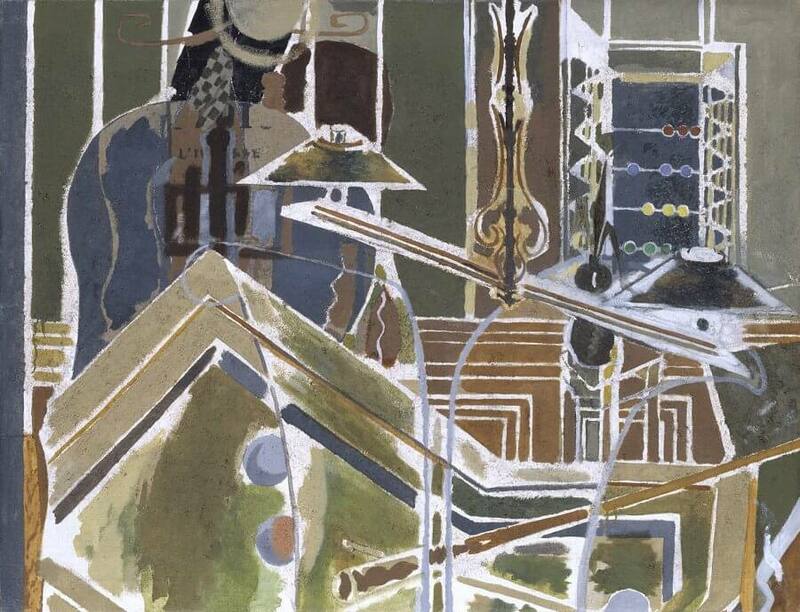 In this way, Braque called attention to the very nature of visual illusion and artistic representation. Beginning in 1909, Braque began to work closely with Pablo Picasso, who had been developing a similar approach to oil painting. At the time Pablo Picasso was influenced by Gauguin, Cézanne, African tribal masks and Iberian sculpture, while Braque was mostly interested in developing Cézanne's idea's of multiple perspectives. A comparison of the works off Picasso and Braque during 1908 reveals that the effect of his encounter with Picasso was more to accelerate and intensify Braque's exploration of Cézanne ideas, rather than to divert his thinking in any essential way. 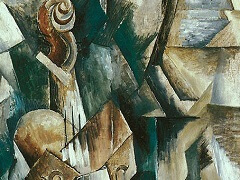 The invention of Cubism was a joint effort between Picasso and Braque, then residents of Montmartre, Paris. These artists were the movement's main innovators. 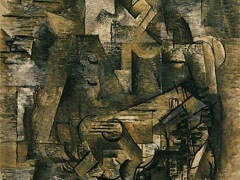 After meeting in October or November 1907, Braque and Picasso, in particular, began working on the development of Cubism in 1908. 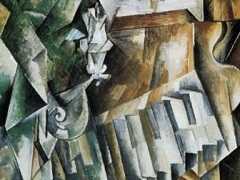 Both artists produced paintings of monochromatic color and complex patterns of faceted form, now called Analytic Cubism. 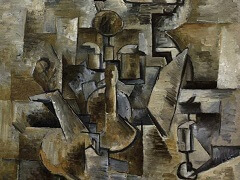 A decisive moment in its development occurred during the summer of 1911, when Georges Braque and Pablo Picasso painted side by side in Céret, in the French Pyrenees, each artist producing paintings that are difficult - sometimes virtually impossible - to distinguish from those of the other. In 1912, they began to experiment with collage and papier collé. Braque was severely wounded in the war, and when he resumed his artistic career in 1917 he moved away from the harsher abstraction of cubism. Working alone, he developed a more personal style, characterized by brilliant color and textured surfaces and following his move to the Normandy seacoast the reappearance of the human figure. He painted many still life subjects during this time, maintaining his emphasis on structure. 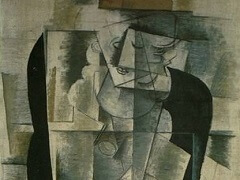 During his recovery he became a close friend of the cubist artist Juan Gris. He continued to work throughout the remainder of his life, producing a considerable number of distinguished oil paintings, graphics, and sculptures, all imbued with a pervasive contemplative quality. Braque, along with Matisse, is credited for introducing Pablo Picasso to Fernand Mourlot, and most of the lithographs and book illustrations he himself created in the 1940s and '50s were produced at the Mourlot Studios. He died on 31 August 1963, in Paris. He is buried in the church cemetery in Saint-Marguerite-sur-Mer, Normandy, France. 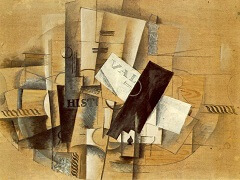 Braque's work is in most major museums throughout the world.